Entrepreneurship Development Program to take place at the Keys Resort in Baga this weekend. The Entrepreneurship Development Program aims at encouraging and building upcoming businessmen through perspective building insights, training, coaching and mentoring. They would provide assistance during the formative years and help startups get ready to go through the challenges of growth ahead. 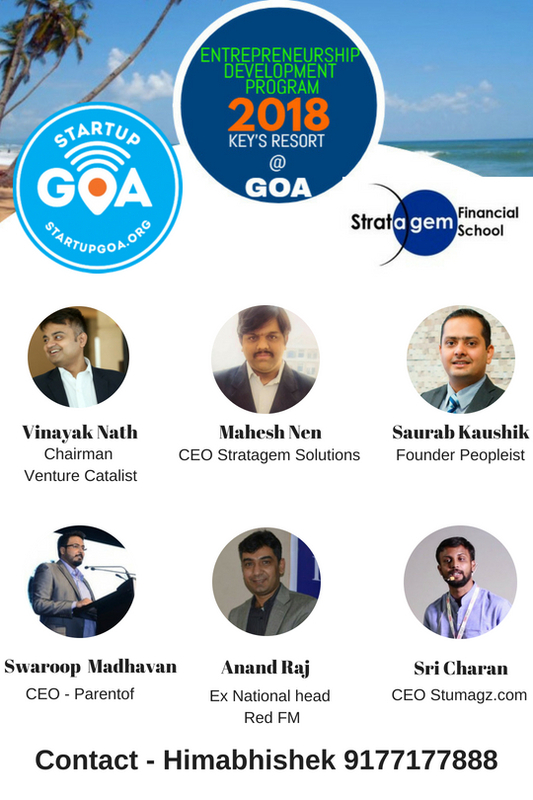 The event will take place from the 25th to the 27th of May at the Keys Resorts in Baga, Goa and is organised by Stratagem Financial School. The forum will focus on inspiring and educating young startups and entrepreneurs. Bringing the Workshop & “The Pitch Room” to Goa, the forum brings together India’s young and aspiring entrepreneurs, mentors, investors, accelerators and corporate acquirers under one roof. They can then discuss expansion plans and celebrate the success of the business community in India. This gives entrepreneurs an opportunity to learn and interact with industry experts giving them a better understanding of their field. The Pitch-room brings together proven business angels to explore ideas and business plans, discuss the provision of equity capital, and consider the development needs of a young company. Notably, the Pitch-room facilitates both sides of a funding proposal with standardized pitch formats for an entrepreneur as well as an investor. It is a definitive physical meeting place where startups can seek out qualified investors. Pitch-room provides an interesting platform and social meeting place, a real opportunity to be part of the early development of exciting new companies, alongside passionate entrepreneurs. Delegate fee for the conference. The delegate Registration fee is Rs. 5999/- per person. This participation fee includes entrance to the conference, one to one meetings, tea-coffee & lunch. There are a lot of other activities taking place that participants would get a chance to be a part of.